- 034Motorsport Vortex Catch Can: The vortex catch can design is used in aircraft and motorsport applications to remove oil and water vapor from the crankcase fumes. As crankcase fumes are forced out, they enter the catch can tangentially, with centrifugal force causing heavier oil and water vapor to fling outward and drain down the walls of the can. This is a much more effective way of separating oil and water vapor than most generic "catch cans". - 034Motorsport Valve Cover Breather Plate: CNC-machined from billet aluminum, this piece replaces the OEM plastic valve cover breather plate and features large-diameter connections for the supplied silicone hoses. - 034Motorsport Intake Manifold Plug with Boost Tap: This CNC-machined billet aluminum provision blocks off the intake manifold port going to the factory PCV system, and can be used to provide a manifold pressure reference for aftermarket boost gauges. - Custom Molded Silicone Hoses: Large diameter hoses ensure restriction free crankcase ventilation, and are made from high quality silicone for extreme durability. 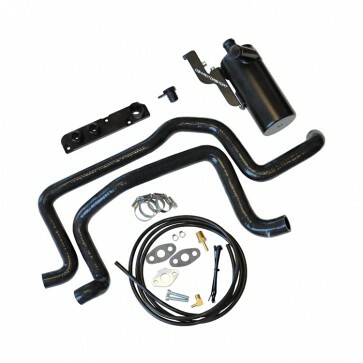 - Installation Kit: We include all brackets, clamps, fittings, and mounting hardware required to install the kit in your B7 Audi A4 2.0T FSI. - 034Motorsport Oil Drain Adapter Kit: This bolts between the stock oil pan and turbo oil drain line without any modification, and allows separated oil to drain back to the oil pan so the can never has to be emptied. NOTE: As a tuner for these cars we have found this and other catch can kits can cause slight cold start idle issues due to eliminating the factory PCV - Breather assembly. This does not affect performance it is just a slight nuisance.